America – Decided to blow up the plane in mid-air because it was carrying a stolen drone control box of tricks. But the problems with this scenario are replete with the description “unlikely”, and probably, “bogus”. Why would those involved hijack a mobile control box of this sort all the way from Pakistan to Malaysia – just to fly it back to some middle eastern country/deserted island? No debris? Where are the bits of plane if indeed this had happened? Given the facts – that the plane definitely flew SOUTH instead of NORTH this scenario is the work of someone who really thinks that Dan Brown is for real. Can’t help them but there’s no way this plane was blown up by the Americans. 2. 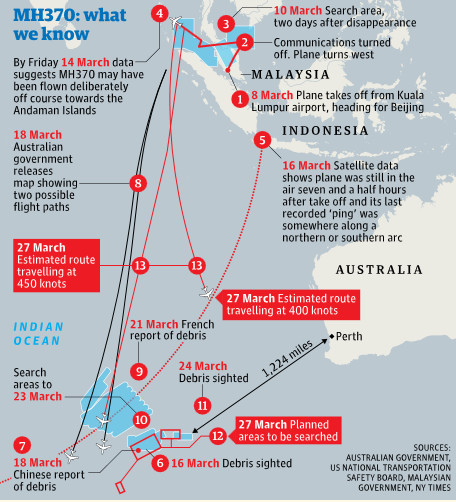 Terrorists seized MH370 – to hold passengers for ransom or something. Oh please! It disappeared in March and we’re in June. If the “terrorists” had in fact seized this plane then they’re a lacksadaisical bunch because they’ve forgotten to issue demands. Ditto if the plane had been seized and blown up. No sign of debris – and why fly it South West into the middle of the ocean? Just stop fantasising folks. There are a few more bizarre examples like Aliens seized the plane in order to conduct their usual experiments with lasers and funny long fingers. Just imagine the middle digit giving the response to this theory. Loonie tunes. I’m afraid people, that pilot suicide is the most likely scenario. The suggestion as noted above has led to effusive name-calling on blogs and social sites globally where long-standing pilots immediately react defensively to the suggestion. Shame. That’s a real pity. Smart, long-serving pilots appear to be allowing their passion for flying to overcome their passion for the truth. All the signs point to those on the flight deck, or one or two of them, taking control and turning into the Indian Ocean and ..well .. disappearing. But where is the plane? As I wrote in March after it became clear that this mystery had stumped all aviation experts, it’s now extremely likely that it will never be found. Now why would someone go to these lengths to avoid location? To avoid forensic analysis. And why would you avoid forensic analysis? So that the insurance payouts which accrue for your children’s life cover are honoured. Unlike the two previous flights where the captain and First officer purposefully flew planes into the granite cloud or the ocean. Egypt Air 990 comes to mind along with Silk Air. While Cairo still harps on about bombs and bad things on board Egypt Air 990 – everyone with half a brain cell now knows that the pilot committed suicide. Silk Air’s flight directly into a river was also proven to be Pilot Suicide. And that’s exactly what happened to Flight MH370. All the facts point directly to someone who from the start of this flight had access to the flight deck and knew exactly when to switch off the transponder and other monitoring equipment. They knew how to turn a large airliner around while descending. They knew to avoid Aceh province in nearby Indonesia. They knew how long they had in terms of fuel – 7 hours – which means the plane would run out of juice precisely over one of the deepest areas of the Indian Ocean. And they knew that the likelihood of someone figuring all this out was almost zero. Except for the pings which the pilot would NOT know his engines were automatically generating because its not part of his/her training. So we can thank those pings for revealing just enough for us to generate informed speculation. Forget what the officials are saying – they’re changing their tune to suit global diplomacy. Real pilots know that the likely fate of MH370 lies with someone on the flight deck. I’ll return to this topic in the coming weeks as more details emerge about the pilot and his mental condition. This entry was posted in Uncategorized and tagged Dan Brown, Egypt Air 990, Malaysian Airline, MH370 by desmondlatham. Bookmark the permalink.